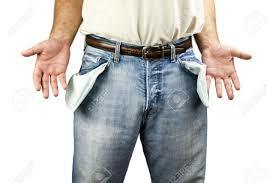 While his pockets were empty unbeknownst to him his wallet was full. For little did he realize that years ago once the money had been rolling in that he told his broker to pull some of it out on a regular basis, for investment purposes. Well that little became a lot over time and his bank account became smaller and smaller until it appeared to be more of a child’s piggy bank in reality. Every month he scrounged to survive while wealth was being created alla carte. Not a bad life for a poor little rich kid.